We left Cambodia on the ropey roads we had arrived on and after giving our remaining ‘riel’ to a number of begging children, who enjoyed playing with our cameras, bags and beads while we waited for our bus, we looked to head north to Chiang Mai. A brief one night stop in Bangkok allowed us to take in the capital city for a third time and armed with a bit more traveling experience, we enjoyed it a lot more the second time round by watching the days football in a number of bars on the Khao San Road. To get to Chiang Mai we took the sleeper train – an overnight service where the seats fold out into bunk beds. This was a great journey; waking up to see the train chugging through jungle-like terrain more than made up for the obscene amount we had unknowingly paid for a few bottles of Chang the night before! After around 10 hours on board we arrived in Thailand’s second city. Lonely planet had told us about a place called ‘Julie Guesthouse’ and when we stepped off the train we saw a guy holding up a sign for this place so we hopped into the free transport to the hotel and duly checked in for a couple of days. The room was a funky array of purple and orange and there was cool communal area with a bar, restaurant area and pool table out the front; all shaded by the trees intertwined with the roof. It was a really cool place and every person staying there was a backpacker. Good times. We spent our first day chilling here and having a look at what treks we could do, but before we headed into the jungle we wanted to try our hand at driving on the busy Chiang Mai roads! The decision to rent a moped each on the second day is one of the best we have made since we got here, although early signs would certainly disagree with that Word of advice, if you are thinking of learning to drive a moped, don’t do it in an alien country with seemingly lawless roads (although it is pretty fun). ….First off we didn’t know how to turn the things on, then when we did get them going we started driving on the wrong side of the road before finally getting on the right side of the road where Westall spun his moped out of control on a hasty start. Toes were grazed, flip-flops were broken and our confidence on the roads thrown into disarray. Sorry mum, we both thought, before deciding to carry on riding the death traps. Having returned the mopeds “safe and sound” we checked into a new guesthouse, JJ’s, and swiftly arranged our jungle trek for the next day. First up on the trek was a trip to an elephant camp. I'm sure you've seen the pictures, this was pretty novel but felt a bit sorry for the elephants. Just traipsing the same route every day. After this we had lunch and carried on the trek until we reached a waterfall. This was cool. Whilst it was only a couple of meters high the weight of the water forced you over when you walked through. That evening we reached our accommodation for the evening, which was in a small village on the hillside. After moaning to each other that there weren't many people our age on the trek we got talking to two older Ozzie guys who were a good laugh. One of them even offered to put us up for a night when we passed through Brisbane! That'll teach us for being so narrow minded! The following morning we walked to another waterfall which was ridiculously cold. Needless to say we didn't spend too long in there. In the afternoon we did some bamboo rafting. The name says it all really. There was 3 to a raft plus a 'driver' who was at the front of the raft. We were both at the back of our rafts attempting to help steer. There were a few heart in the mouth moments when we went over rocky parts but in the main it was really relaxing. Having returned from the trek that afternoon we set about organising our travel arrangements back to Bangkok. 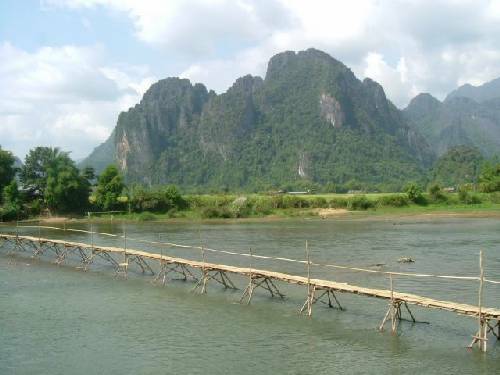 We always thought we'd have a spare couple of days before our flight, so in a slightly rushed, spare of the moment decision we decided to go to Laos. As you do. The tourist lady at our hostel was adamant we had enough time if we took the speedboat from the Thai-Laos border rather than the 2 day slow boat. We thought this was panning out perfectly. Instead of twiddling our thumbs in Bangkok for a couple of days we'd get another stamp in the passport. We should have known things in this part of the world never go exactly according to plan. The bus ride from Chiang Mai to the border was fine, yet in the morning we crossed the river into Laos to be picked up and taken to the place where we'd catch our speedboat. As seven of us piled into the tuk-tuk the driver came round and started his pep talk/disclaimer. It was along the lines of, “Because the water is low at the moment the journey can be very dangerous due to the rocks.” “Have you had any accidents this year?” I asked, half joking. “Yes” he replied, straight faced. “But last year a German tourist died doing this journey.” Stunned silence followed this revelation. Me and Westall just looked at each other, a disbelieving smile creeping over our faces. I think there was a split second when I imagined the two of us heroicly disembarking at the end of the journey before I heard the words again. Possible death. Hmm, “We'll take the bus please.” was the inevitable outcome. We thought the buses in Cambodia were bad...After multiple delays we eventually got going hoping to get to Luang Prabang about 10pm just in time for United Spurs Cup final. Hope is a fine thing. We roll up to the hostel at 3:30am. Not happy. You float down the river surrounded by the most amazing scenery you can imagine, lush green mountain, the sun beaming down, every so often getting pulled into a bar for a drink on the platform made of stilts and a rope swing into the river. Absolutely class. The first bar the biggest zip wire. Its funny it never looks that high from below, yet as soon as you start to climb the ladder the old stomach start fluttering. If this is what I felt like doing this god knows how I'm going to manage a bungee....Still, we both did it and came out happy as larry. Unfortunately the same couldn't be said of the second jump. I waited too long so the handle hit the stopper sending me into a sequence of back flips, I think I made it to two and a half before I slapped into the water. Ouch. They should have had a sign, “Let go before the end” b******s. After a few more bars, one with a mud bath we made our way back to the bungalow.